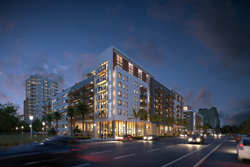 ZOM Living has closed on the purchase of a 3.16-acre parcel, and will break ground in the coming months on Las Olas Walk, 456 apartment homes to be housed in two 8-story buildings connected by air-conditioned walkways. Residents will be steps away from the fashionable Las Olas Boulevard and will enjoy convenient access to downtown amenities such as The Riverfront, Broward Center for the Performing Arts and the hip, cultural area emerging at Flagler Village. Las Olas Walk will boast 14,000 square feet of private resident amenities on the ground floor. Adjacent to the amenity areas and enveloping the canal will be a large courtyard that is anchored by a resident pavilion with outdoor bar and lounge. Extending above the canal will be a deck and floating dock which will give residents the opportunity to experience the water via paddle board or kayak. In addition to the ground floor amenities, an expansive 20,000 square foot rooftop deck will be located on the 8th level of the South Building and provide residents with expansive views of the New River, Downtown Fort Lauderdale and the beaches. The Las Olas Walk site achieved a WalkScore of 95 and is within blocks of Brightline’s new Fort Lauderdale station which will foster commuter transportation as well as business and tourist travel between Miami and Orlando. The Wave Streetcar stop is a 5-minute walk, providing convenient transportation within the downtown area. Las Olas Walk first units will be delivered early 2020, with pre-leasing starting late 2019. ZRS Management, LLC has been retained to provide leasing and property management services. Construction financing was provided by PNC Bank and Santander Bank. KAST Construction is the general contractor, RTKL is the architectural firm for the project and the award winning firm of Stantec will provide interior design. ZOM Living is one of the most highly regarded luxury multifamily developers in the United States, and has joint ventured or directly developed over 18,500 apartment units nationwide, with an aggregate value of nearly $3.5 Billion. Throughout its 40-year history, ZOM has garnered more than 150 industry awards for project design and development expertise, including the prestigious National Multifamily Development Firm of the Year award and, most recently, two national Pillar Awards from the National Association of Home Builders, for Best Low-Rise Project (Baldwin Harbor, Orlando) and Best High-Rise (Monarc at Met3, Miami). ZOM Living is headquartered in Orlando, Florida, and has regional offices in South Florida, Texas, Washington D.C. and Raleigh. ZOM Living has 5,000 units currently under construction or in design/predevelopment throughout the U.S., with a total capitalization of $1.7 Billion. For more information on ZOM’s multifamily portfolio, visit http://www.zomliving.com.